While we are usually contacted by those interested in our website design service, we often discuss the above four core services, which can be combined. Where clients commission our domain name, website, hosting and on-line marketing services, this allows us to configure, integrate and manage these on your behalf, as effectively and seamlessly as possible. Present your products or services online with a multiple page 'brochure website'. The above packages reflect what clients often require, & can provide a useful starting point for identifying the type of website you require. 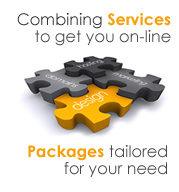 The diagram below shows how our four core services combine. Whilst you can manage your own domain name, hosting or SEO services, having them managed by a single company will certainly make things simpler for you and allow them to be integrated more effectively. You can read more about our individual services or contact us using the form below to discuss how they may be used to achieve what you have in mind.